Alexander McQueen, “Crown of Thorns Headpiece” (Autumn/Winter 1996–1997), installed at The Met Cloisters’ Treasury. The tapestry in the background is a Southern Netherlandish altar frontal depicting the instruments of Christ’s Passion (1475–1550). Photograph by Risham Majeed. The notion of the desertion of the divine is one that affects much religious art in the space of the museum. Previously functioning spaces and ritual objects struggle to assert their former powers of conjuring the sacred once they are inserted to serve other narratives in art museums. Medieval art, like so many other cultural traditions based in ritual, primarily had to be successful in the spiritual work that it was commissioned to aid. In the museum of today viewers experience objects that have ceased to be useful, yet as museum practitioners we often strive to channel and activate some of that “deserted divinity” through language, lighting, and ambiance. The Met Cloisters, 2018. Photograph by Risham Majeed. First, a word about the medieval cloister itself: it is the architectural and spiritual nucleus of a monastery. It connects the disparate rooms of the monastic precinct through a covered walkway with a central garden that is open to the sky. It is also the place where monks come to meditate on, memorize, and recite out loud sacred scripture. 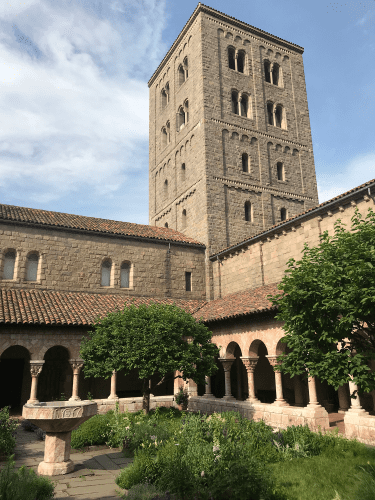 At the Cloisters, the fragments from the twelfth-century Benedictine monastery of St. Michel de Cuxa have been rebuilt in the center of the museum using stone from the same quarry that the medieval sculptors employed. To an untrained eye, it is difficult to differentiate the twentieth-century elements from the twelfth-century stones, and the Cuxa cloister functions architecturally in the museum the way it would have in the monastery: as an organizational device connecting the various galleries of the museum. Even though it is only a quarter of the size that it would have been in the twelfth century, a visitor encounters the architectural space as it was intended to be experienced. 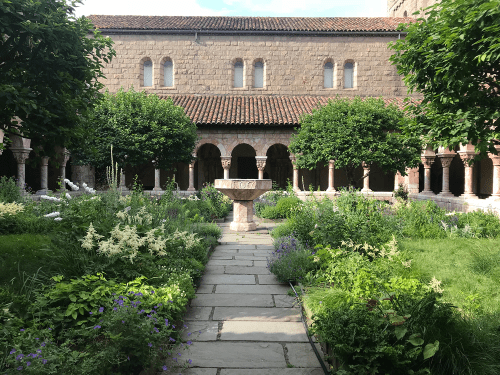 In this way, the arrangement and presentation of the collection at the Cloisters is inevitably bound to the simulation of a medieval universe, even if it stops just short of recreating that world. The Met Cloisters, fragments from the cloister of the monastery of St. Michel-de-Cuxa (c. 1130–1140), rebuilt 1930s. Photograph by Risham Majeed. 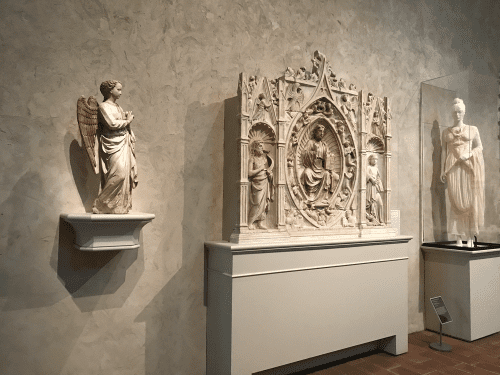 In the decades since The Cloisters opened in 1938, the Met has theorized the Cuxa cloister as a “period room” featured in the same volume as the more familiar French period rooms in the Wrightsman Galleries at the Met Fifth Avenue. In the foreword to this reevaluation of period rooms at the Met, then-director Phillippe de Montebello wrote, “Visitors to the Cuxa cloister invariably lower their voices as if they feel the presence of monks making their way to vespers, and the Astor court is as much a retreat for the harried New Yorker as its inspiration was for the Chinese scholar who first built it.”5 Whether or not Montebello’s observation is verifiable, there is something about inhabiting formerly sacred spaces at the Cloisters, even temporarily, that adjusts our attitude and behavior. In his classic study, The Poetics of Space, Gaston Bachelard observes how once a space is lived in, it becomes organic and loses its cold rectilinearity; “inhabited space transcends geometrical space.”6 In other words, spaces occupied by people acquire a kind of humanity of their own, and this effect is part of the transformation of the Cloisters through Heavenly Bodies. The Met Cloisters, Romanesque Hall. Photograph by Risham Majeed. The Met Cloisters, Unicorn Room. Photograph by Risham Majeed. The Met Cloisters, Gothic Gallery. Photograph by Risham Majeed. Detail of an ensemble by John Galliano (Fall/Winter 2006–2007) in the Gothic Gallery. Photograph by Risham Majeed. Each gallery at the museum is populated with dressed mannequins that relate to the collection thematically, formally, or performatively. The mannequins were manufactured specifically for the exhibition; Bolton went back and forth with the sculptor multiple times to ensure that their expression bore a sense of reverence. Initially Bolton’s idea was to duplicate the face of the Virgin Mary in Michelangelo’s Pietà (1498–1499), which proved difficult; yet the overall demeanor of Michelangelo’s Virgin is preserved.7 Both the male and female mannequins have their eyes closed, their chins tilted slightly upward, and stand on their tiptoes: the effect is one of an active repose, alert and humble, deferential and quietly assertive, as if responding to the palpable presence of the divine in the now-defunct apse, cloister, chapel, and chapterhouse. Detail of Heavenly Bodies mannequin. Photograph by Risham Majeed. Barnard wanted to recreate the entire atmosphere of the Middle Ages, so his museum took the form of a basilica—the central longitudinal space functioning as the nave with subsidiary aisles on either side. 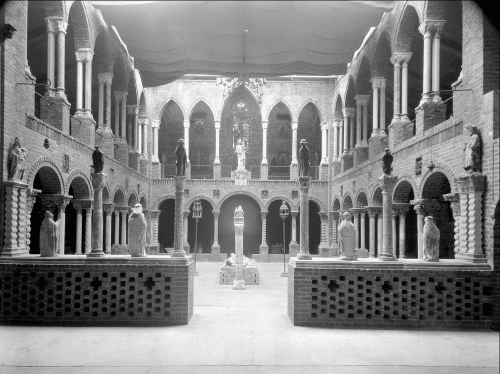 George Grey Barnard’s Cloisters Museum, the “nave” or central exhibition space, c. 1925. Here we see elements from several cloisters reassembled. Also note how individual sculptures are raised on freestanding columns, perhaps the origin for the elevated mannequins in Heavenly Bodies. Image © The Metropolitan Museum of Art. Image source: Art Resource, NY. Baron J.I. Taylor, Charles Nodier, and Alphonse de Cailleux, "Porche de l'eglise de l'abbaye de Moissac." Voyages pittoresques et romantiques dans l'ancienne France: Languedoc (1833). Photograph by Risham Majeed, courtesy The Cloisters Library. Baron J.I. Taylor, Charles Nodier, and Alphonse de Cailleux, "Vestibule. Eglise de L'Abbaye de Moissac." Voyages pittoresques et romantiques dans l'ancienne France: Languedoc (1833). Photograph by Risham Majeed, courtesy The Cloisters Library. These lithographs conflate medieval and modern time through their vignettes of actors engaged in a variety of activities. In some, local townsfolk appear oblivious to the ancient ruins, and in others, single figures of aristocratic origin are absorbed in acts of piety.15 When I first saw the installation of a bride at the threshold to the apse of the Romanesque church of St. Martin from Fuentidueña, I was immediately transported to an image from the Voyages of a medieval woman standing at a threshold in a different place: the narthex of the Romanesque abbey of Moissac in Languedoc, France. The Met Cloisters, installation showing the apse from the church of St. Martin from Fuentidueña (c. 1200). The bride is dressed in a wedding gown by Cristobal Balenciaga from 1967. Dressed in a form-revealing gown tightly cinched by a long belt at the waist, she stands turned away from us, hands clasped around a rosary, looking out of the open door to the porch beyond.16 What is the role of this woman in this series? The simple reason is to give us a sense of scale (exaggerated, in this case), but more importantly, her presence lends a veneer of authenticity to the rendering, which satisfies the viewer’s imagination as to what this structure might have felt like in the Middle Ages. 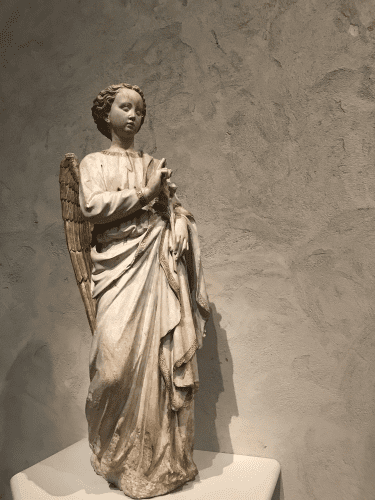 This desire to return the monument/object to an imagined authenticity also motivated Barnard’s museum and continued to inform the design for The Cloisters after John D. Rockefeller, Jr. provided funds to the Metropolitan Museum of Art to acquire Barnard’s entire collection. Charles Collens was hired to design the new structure, and together with Joseph Breck, the Met’s curator of decorative arts, they devised the galleries of the museum, which opened in 1938.17 There exists a wealth of correspondence between Breck, Collens, and Rockfeller regarding design decisions, which allows us to map the evolution of The Cloisters’ ethos. 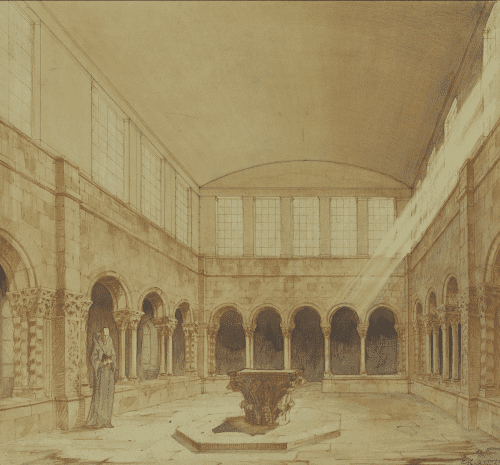 For example, both Breck and Collens proposed designs for the gallery that was to enclose the reconstructed cloister from St. Guilhem-le-désert in 1933. Breck’s rendering shows a modern skylight, which would let natural light into a closed gallery to approximate the open-air arrangement of the original garden. Collens’s solution was to insert a clerestory of windows on all four sides. Breck’s solution, which was cleaner, was accepted on March 31, 1933. Charles Collens, rendering of gallery for the rebuilt fragments from the cloister of St. Guilhem-le-Désert (1933). Image © The Metropolitan Museum of Art. Image source: Art Resource, NY. 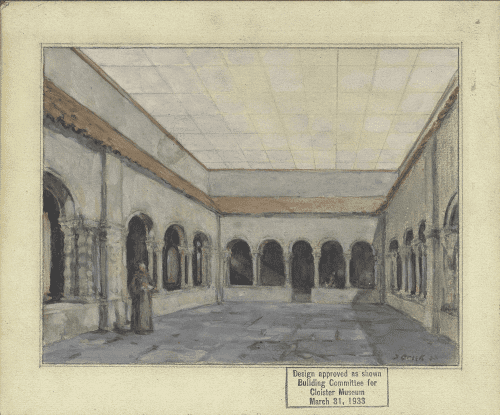 Joseph Breck, rendering of gallery for the rebuilt fragments from the cloister of St. Guilhem-le-Désert (1933). Image © The Metropolitan Museum of Art. Image source: Art Resource, NY. However, both Breck’s and Collens’s mockups included a medieval monk in the space rather than a contemporary visitor, betraying that innate yearning for authenticity, the desire to be in tangible communication with medieval users and makers. 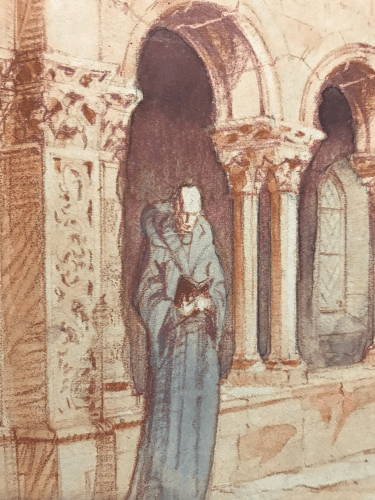 In Collens’s rendering, the monk holds a book in both hands and his mouth is open, either in song or because he is reading out loud, an act that is entirely commensurate with the activities conducted in a medieval cloister.18 Breck’s watercolor also includes a tonsured monk in a brown habit, but his is more summarily rendered, so we can only discern that his hands are clasped in front of him, perhaps in a gesture of prayer. These monks were fantasies, much like the woman in the Moissac lithograph produced precisely a century before these proposals, and they never made it into the final arrangement when the museum opened to the public in 1938. Charles Collens, rendering of gallery for the rebuilt fragments from the cloister of St. Guilhem-le-Désert (detail) (1933). Valentino, Ensembles (Fall/Winter 2015–2016) in the St. Guilhem Cloister. Photograph by Risham Majeed. 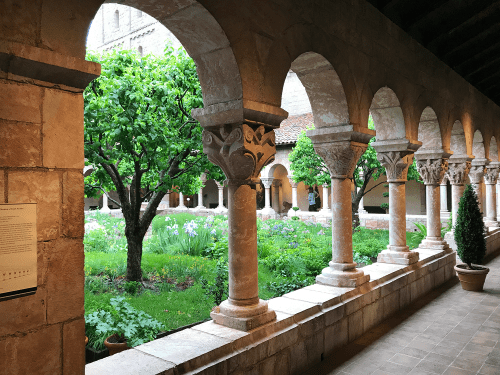 Indeed, the St. Guilhem cloister is anthropomorphized through this engagement, and comes to life as our eyes dart back and forth between the tiered arcades of the cape and the rhythmic repetition of arches in the cloister. Valentino was inspired by the stacked stories of round arches of the Colosseum in Rome, just as Romanesque sculptors appropriated the forms of Roman monuments that populate western and southern France, such as the Pont-du-Gard in Nîmes.20 Through such parallels we can understand appropriation as a reanimation of the past filtered through the concerns of the present, which is a strategy that transcends place and time. 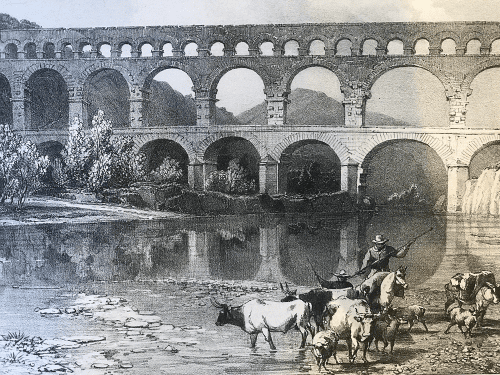 Pont-du-Gard, Nîmes from the Voyages pittoresques et romantiques dans l’ancienne France: Languedoc (1833). Photograph by Risham Majeed, courtesy The Cloisters Library. The most convincing and illuminating of the vignettes are those that engage with the collection beyond one-to-one parallels with famous works of medieval art repeated on the clothing. These transcriptions, like the dresses by Jun Takahashi dispersed in the “Garden of Eden” runway, are gorgeous but gratuitous, as are Alexander McQueen’s ensembles in the Late Gothic gallery. "Garden of Eden" at The Met Cloisters. Ensembles by Jun Takahashi (Spring/Summer 2015). Photograph by Risham Majeed. Alexander McQueen, Ensembles (Autumn/Winter 2010–2011) in the Late Gothic Gallery. Photograph by Risham Majeed. 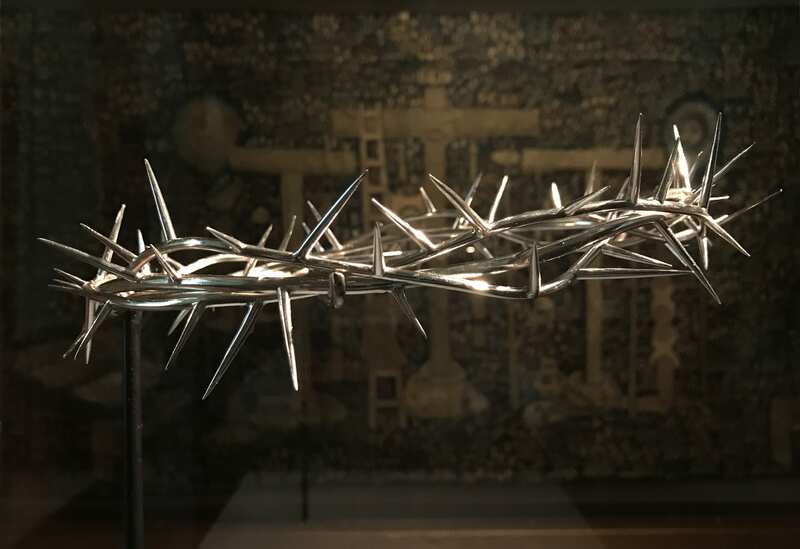 Rather, McQueen’s radical sartorial appropriation of Catholic iconography is again best appreciated through fragmentation and absence: at the entrance to the Cloisters’ Treasury, suspended at head height, is McQueen’s silver “Crown of Thorns Headpiece” (Autumn/Winter 1996–1997). It hovers in front of a sumptuous tapestry depicting the Crucifixion scene, which is missing Christ; both the medieval and modern await the return of the divine, and through this dialogue they partially complete one another. This object is one of the most arresting in Heavenly Bodies because of its deep connection to the cult of relics that affected nearly every aspect of medieval culture. A relic is organic matter: a piece of bone, a hair, an arm, of a saint; in and of themselves, relics are humble and perishable reminders of the transience of humanity. They need reliquaries, with all their gold, silver, and jewels, to convey the spiritual potency of the saint. McQueen’s “headpiece” has conflated relic and reliquary, with the precious material taking on the form of the relic to become one and the same. This is a cunning curatorial choice because the Treasury is filled with reliquaries and other cherished objects, including chalices used in the celebration of the Eucharist, which await the viewer in the adjacent gallery. 21 Another more incisive, subtle, and playful insertion is of a gossamer light pink dress by John Galliano (Spring/Summer 1986), to the right of a carved marble altarpiece by Andrea da Giona (1434). This seemingly weightless ensemble becomes an avatar for the missing Virgin Mary, and completes the Annunciation by engaging with the Angel Gabriel on the other side of the altar. Installation at The Met Cloisters of an altarpiece by Andrea da Giona (1434) with an ensemble by John Galliano for the House of Dior (Spring/Summer 1986). Photographs by Risham Majeed. 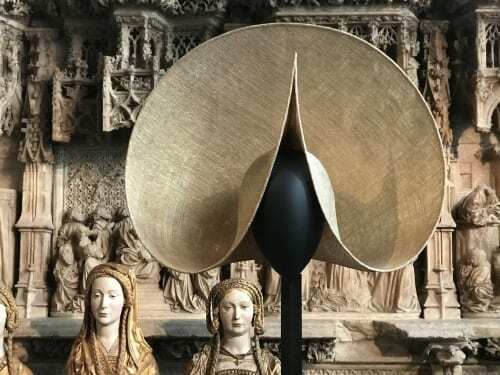 Philip Treacy, “Madonna Rides Again” Hats (1998), installed in the Boppard Room in front of three female reliquary busts. Photograph by Risham Majeed. Risham Majeed joined the department of art history at Ithaca College in 2015 after completing her PhD at Columbia University. At Ithaca College, Majeed teaches courses on the history of museums and exhibitions, African art, and medieval art. This Spring she organized an interdisciplinary symposium, “Primitivism before/beyond Modernism,” which considered primitivism as a trans-historical strategy of self-definition. In Fall 2018, Majeed will teach an Exhibition Seminar that will mount an exhibition on the theme of “African Art and Authenticity” in Spring 2019 at the college’s Handwerker Gallery. This will be another collaboration with Cornell University’s Herbert F. Johnson Museum, and will feature additional loan objects from NYC collections. Her research on Meyer Schapiro is forthcoming in RES: anthropology and aesthetics, as an article entitled “Against Primitivism: Meyer Schapiro’s Early Writings on African and Medieval Art.” Her current book project chronicles the parallel treatment of medieval and African art as “primitive” in the museums of the Trocadéro palace in Paris (1878–1937), and is entitled Primitive before Primitivism: Medieval and African Art in the 19th Century. Majeed is a member of CAA’s Museum Committee and has been a lecturer at the Met Cloisters since 2006.